A pop up cake is a versatile insert suitable for most cards be it birthdays, anniversaries, and any form of celebration. 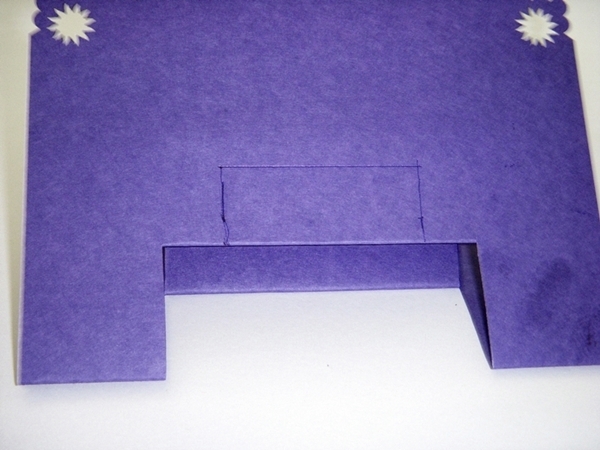 The pros say you should keep the outside of a pop up card simple ! 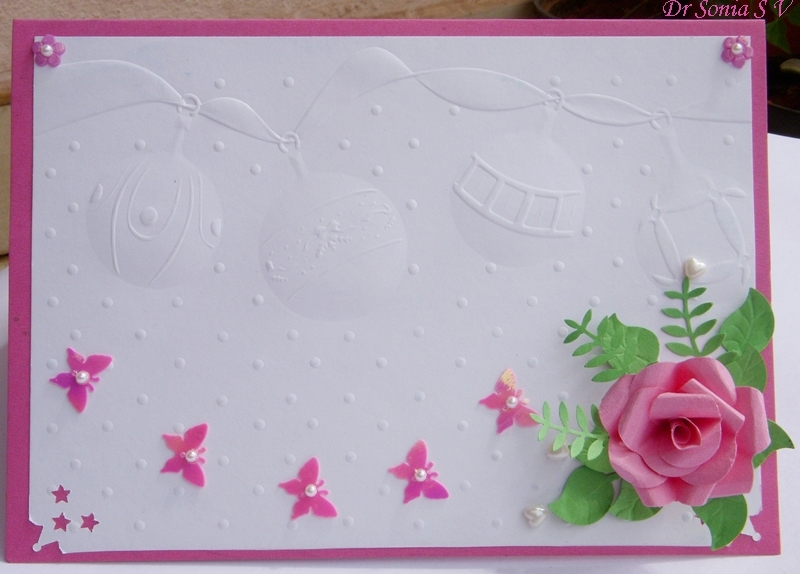 So only used a paper rose,some plastic butterflies and pearls on this lovely embossed white paper .Since my theme is celebration the embossing reflects party baubles and ribbons. I made the paper rose using my heart punch and here is the link to the Heart punch Rose Tutorial. 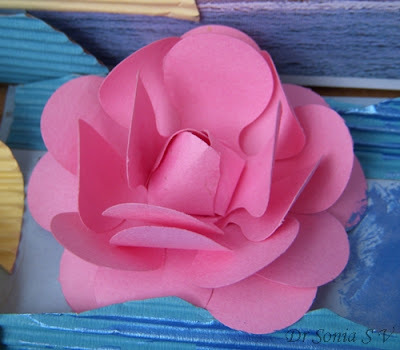 The Felt flower is handmade by using a circle of felt , cutting it in a spiral and rolling just like you make a spiral paper rose. Only difference from a paper spiral rose is its difficult to hold a felt rose using white glue so I used a glue gun.The shiny metallic green leaves were bought from a local fancy store. 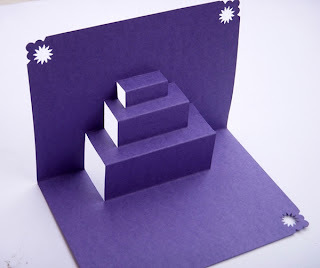 This is one of the simplest Pop up Cake cards you can make.Why I like it so much and am sure you would too is that you don't have to use a scale to measure . 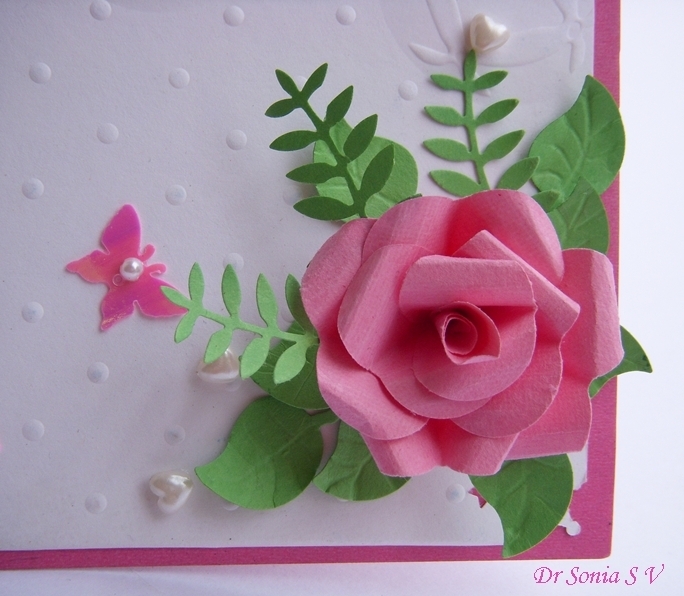 You dont need a Craft knife and it can be made in a jiffy to beautify any card! Card stock for Pop up card Insert:Here I have used half of an A 4 card- You can use thin paper too to make this pop up cake card. 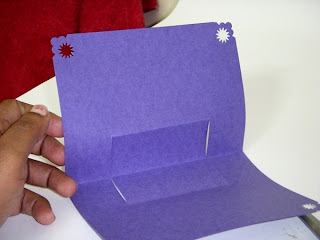 Don't use too thick paper as it wont fold well. 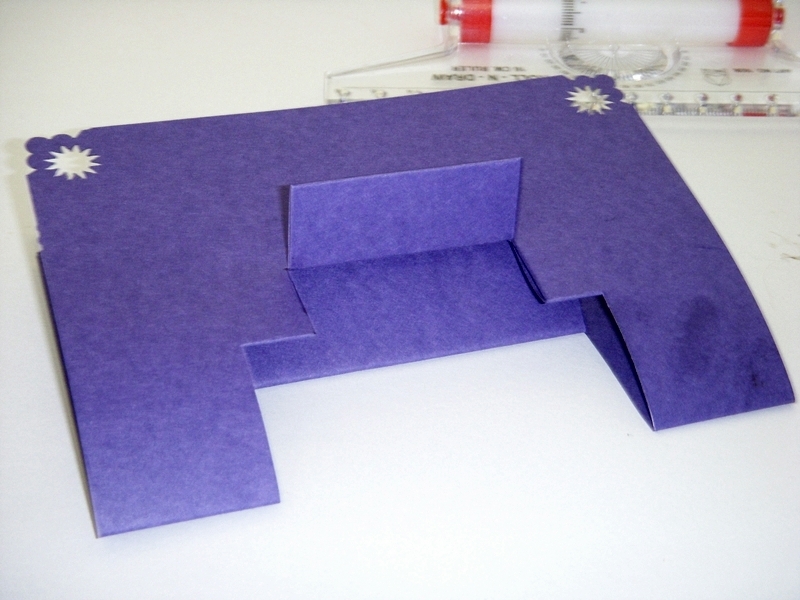 From the central fold line drop down 2 parallel lines around 2- 2.5cm long [make it as wide as you want].Join the 2 lines. 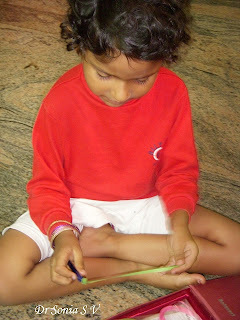 Here you can see my latest toy-- its called a " Roll N Draw" I picked it up from a local stationary shop for 20 Rupees[ quite cheap! ]Its a fantastic instrument -quite handy to draw parallel lines, circles,arcs,squares,measure angles!A useful tool for the paper engineer! Dont worry about erasing any lines as you are working on the wrong side of your pop up cake card.Cut the parallel lines you drew. 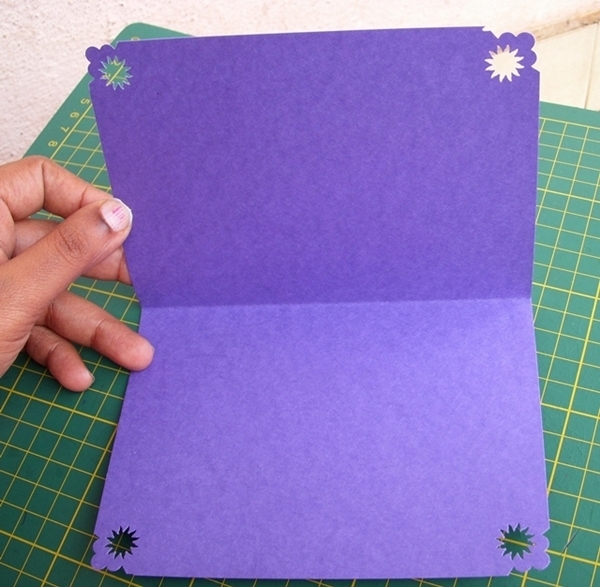 Open the card and this is how it will look. 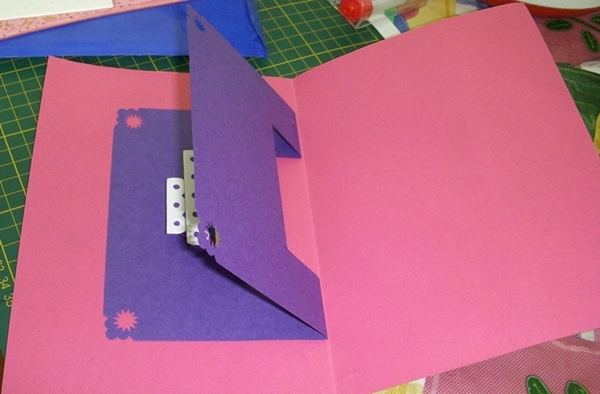 Now reverse your fold by pushing at the central fold from behind and you have the bottom layer of your pop up cake card. Close you card.Drop down 2 parallel lines like you did earlier only make them smaller say around 1.5 cm long. 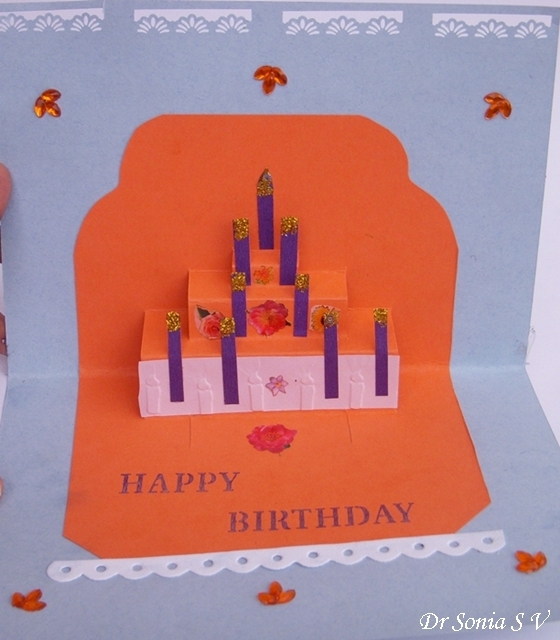 Since you are making a cake ,position the lines so as to make the 2nd cake layer at the center of the lower layer. 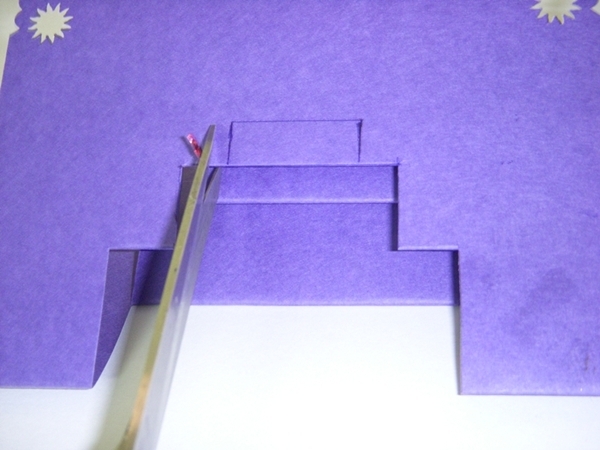 Cut only the top layer as shown. Fold and reverse your fold like you did earlier . 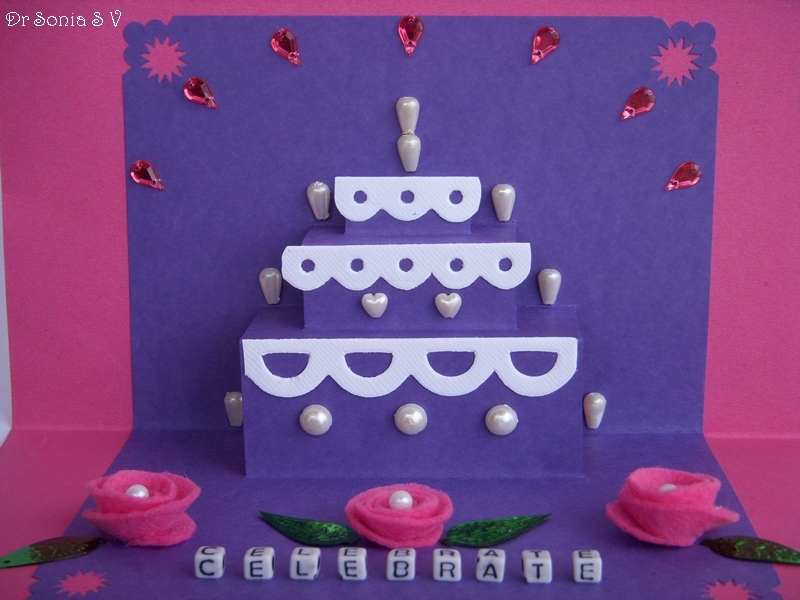 Now you have made the 2nd layer of your pop up cake card.Stop there or go ahead and add one more tier to your pop up cake! In the similar fashion you can make as many layers for your pop up cake as you want.Only take care to make the length of your drop lines smaller than the previous layer's. 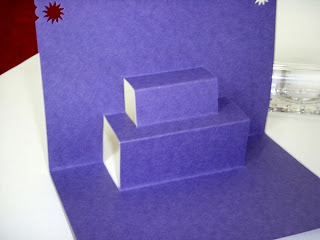 This is one of the simplest pop up mechanisms and you can build all sorts of scenes on the steps. 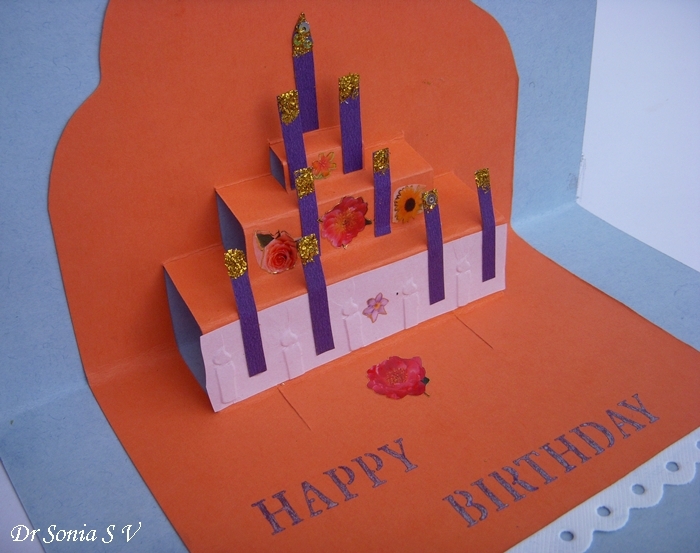 Add candles, flowers, faux icing what not! 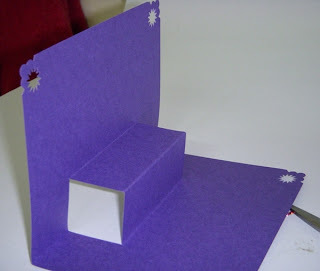 One more tip I would like to share about making a pop up card is to take care while sticking your pop up to your base card. 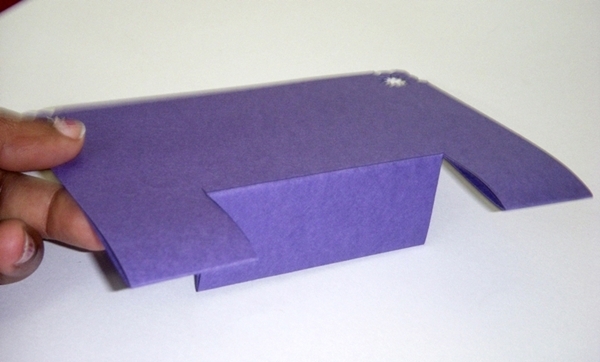 Most pop ups look more effective stuck on a base card of contrasting color. 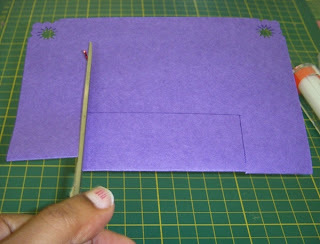 Apply glue well to all the corners and edges and position the central crease flush on to the base card central crease. Apply glue on one side at a time as shown.Dont use extra glue as glue seepage can spoil our pop up effect.Apply glue to the other side of the pop up mechanism and fold the base card over on to it. 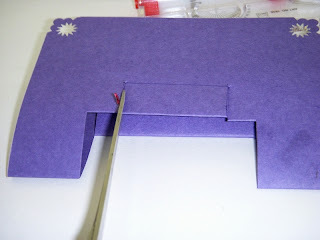 The golden rules are to apply glue to all edges and corners, apply only a little glue ,test your pop up and then allow enough time for the glue to dry. Have fun making a simple pop up cake card. 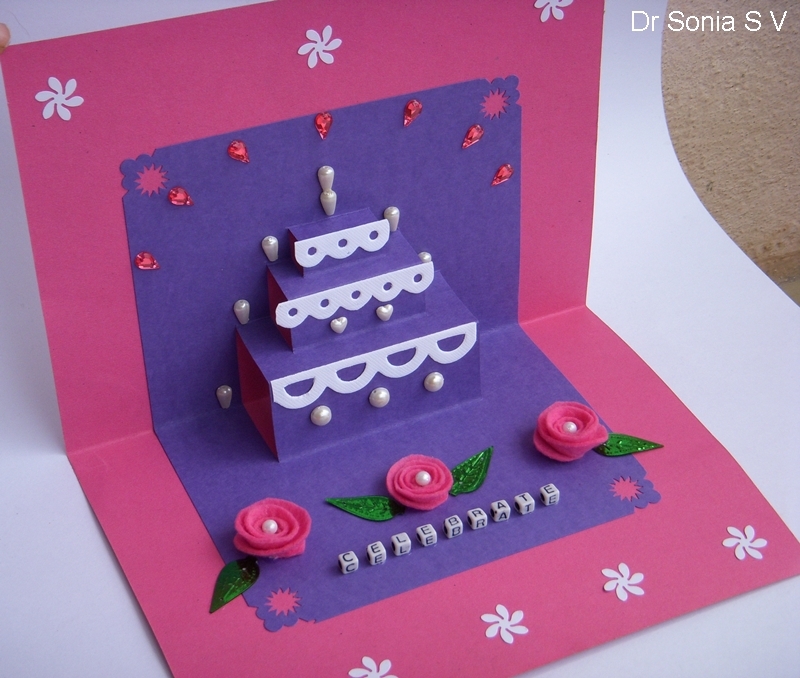 And do tell me how you like this celebration card. Though I do a lot of crafting with my 5 year old daughter I haven't really let her quill much.Recently I thought we would quill together! 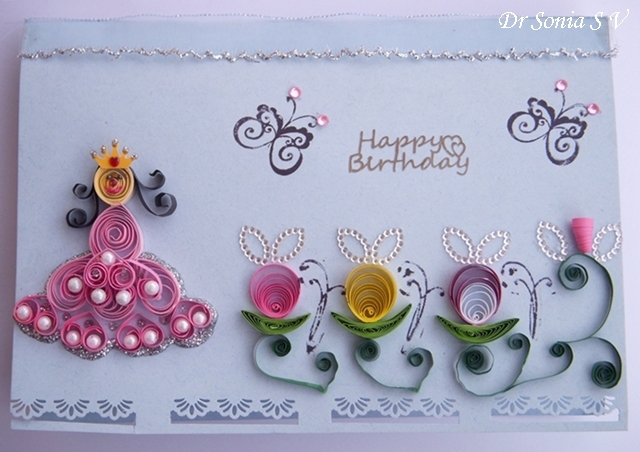 We decided to make a Princess in the garden card! Its a kiddy type card and I kept it fairly simple so that my little helper could help to stick the quilled flowers.Here is my Kiddo planning the card. 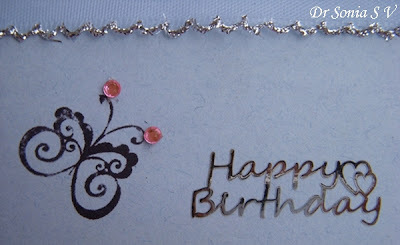 She has very definite views on how to embellish a card and most of the times her ideas are awesome! A tip if you want to let young kids quill- let them make tight coils or the green bottoms of the flowers like we have made here- then the imperfections dont show and it will still look lovely. Oh this is my first card with stamping too! 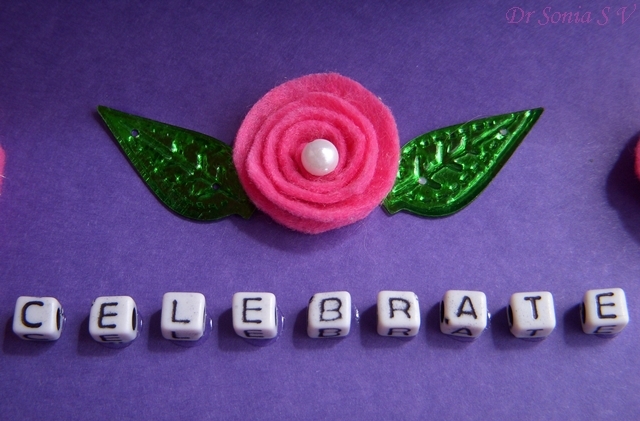 Used stamps won in dear blogger friend Jessica's giveaway. 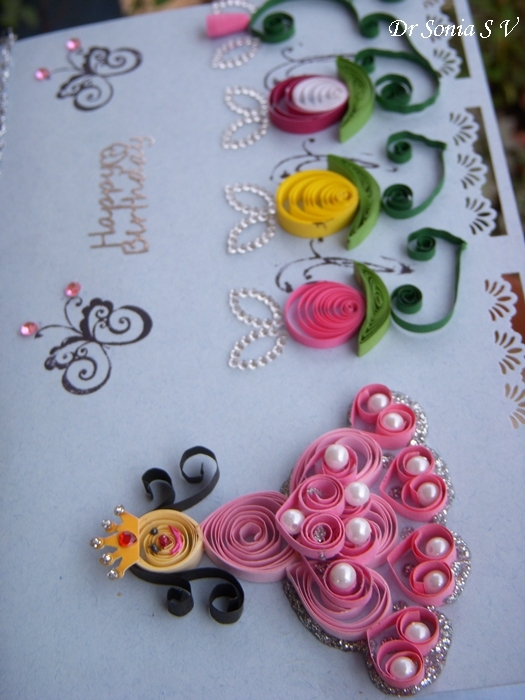 This is a closeup of our quilled Princess. 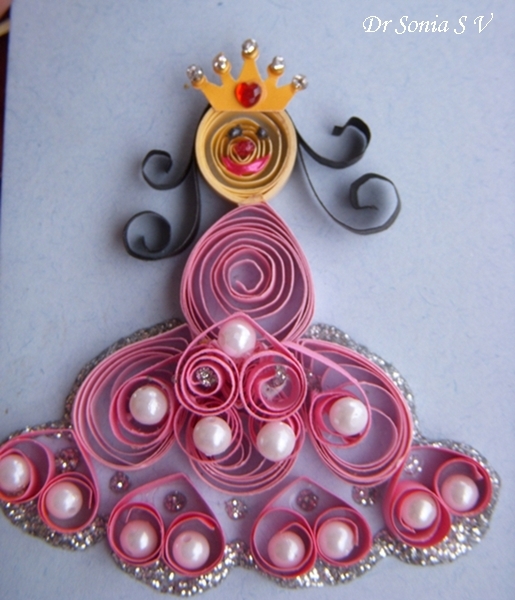 All little girls love Princesses and mine of course wanted a pink one!When I made the quilled princess I didn't have pink quilling strips so had to hand-cut the strips hence do forgive the imperfections. Here is how we made our quilled Princess. 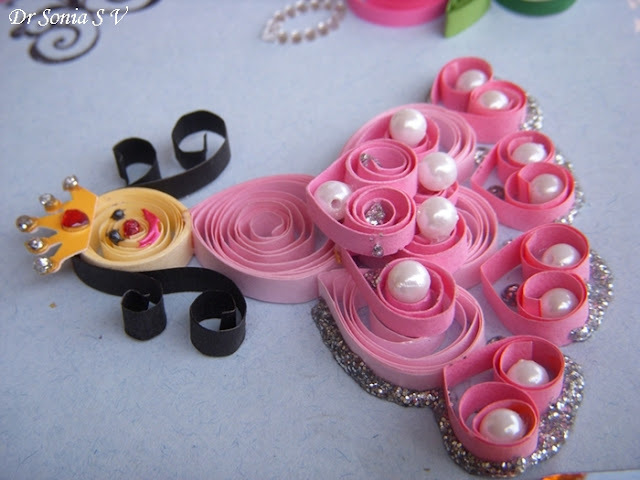 There are a lot of quilling pros out there and I am just sharing our simple quilled girl for the benefit of the "non-experts"! The face and body are loose coils.We made the skirt with 3 tear drops and added inverted hearts for the border of the quilled girls skirt. To give the skirt volume and an added 3 D effect we added 2 large hearts and a small heart for a 2nd layer. On top of the 2nd layer of the skirt we added a single heart and added pearls to glamorize our Princess's ball gown! The eyes,nose and mouth of our Quilled Princess were drawn with glitter glue.I used tiny bindis for the gems on the crown. For the benefit of my non-Indian readers, bindis are stickers popularly used by Indian women to adorn the forehead and they come in a fantastic range of different sizes and shapes. 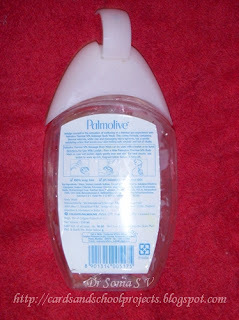 As my blogger friends know I love to add an interactive element. 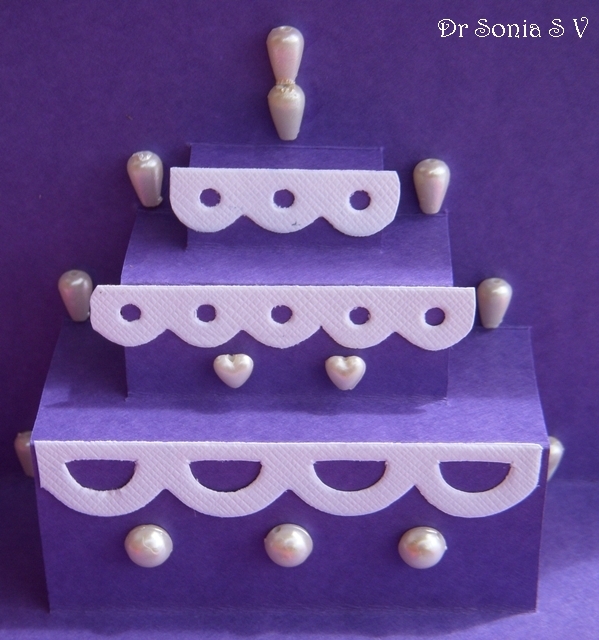 Nothing elaborate this time just a simple pop up cake to celebrate a little Princess's birthday. 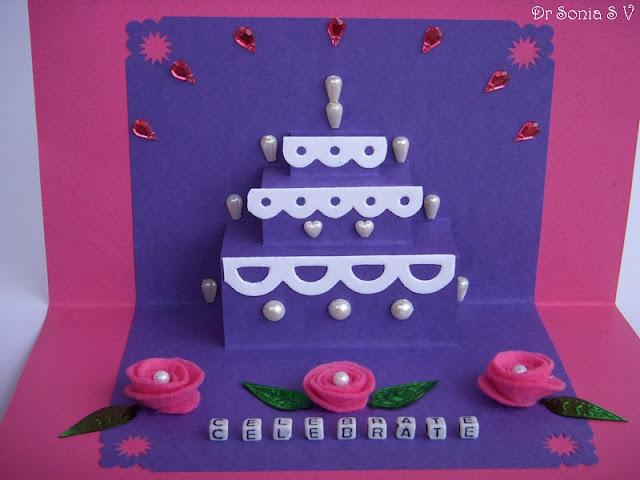 Here is the link to the Tutorial for the pop up cake card . 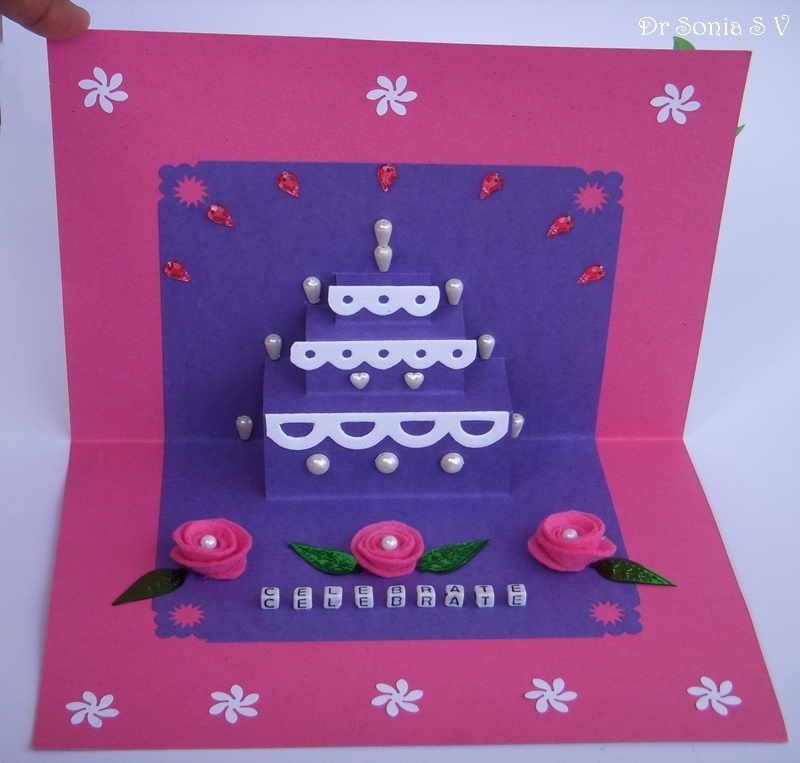 As always do leave me your comments on what you think about our quilled card and pop up cake.I know it has a lot of imperfections and I almost didnt post it then I thought --let it be! So do be kind!! I was missing from blogland as we had gone on a family holiday to Pondicherry in South India.An interesting thing about Pondicherry is that French is an official language of the Indians there and the streets retain French names! Well let me not bore you with more tourism info[ I seem to be doing that too much nowadays! 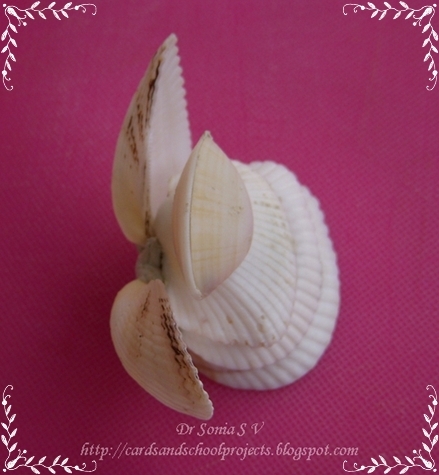 ].While sightseeing we landed by mistake on a "non tourist" beach and we were greeted by the most wonderful sight-- the beach was encrusted with such gorgeous shells! 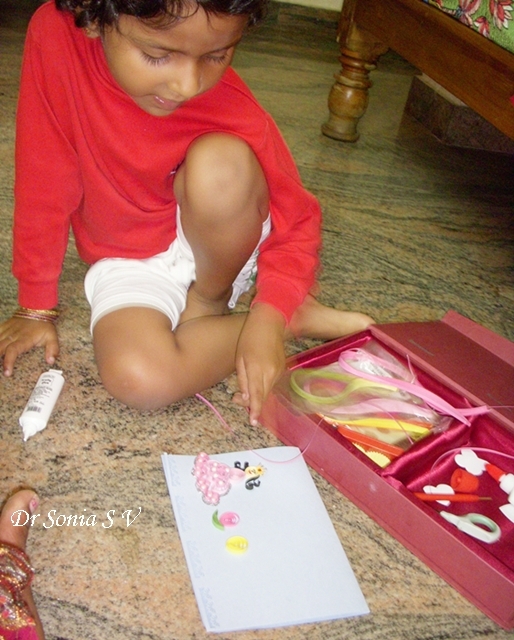 To crafty souls like my daughter and myself it was like being dazzled by diamonds ! 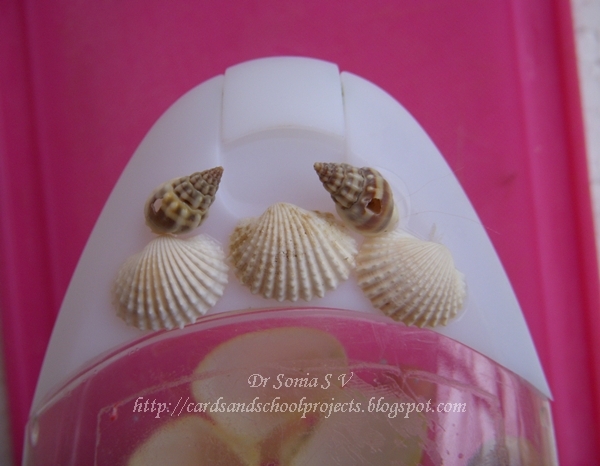 We were crazy with delight and picked up so many lovely shells.I have nearly 2 kilos of them now! The moment we reached home we just had to play with our precious shells! 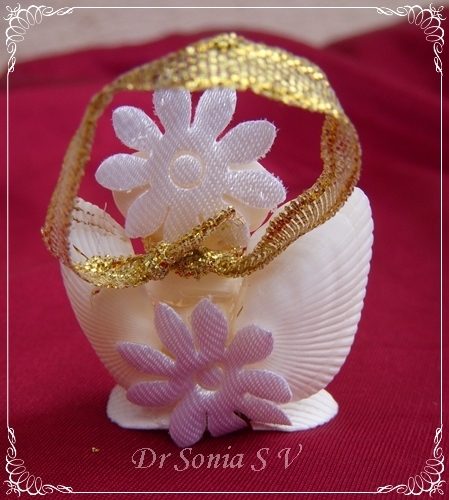 Its a simple shell design stuck on with white glue excepting for the shell leaves which I wanted to stick out at a perpendicular and hence used Mseal. Here is a simple pattern on the bottle cap. 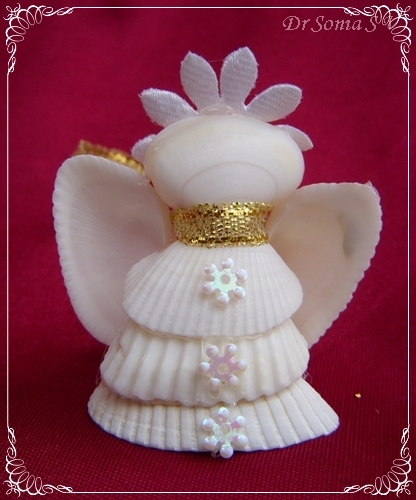 The Shell Angel is pretty easy to make if you have a good adhesive. 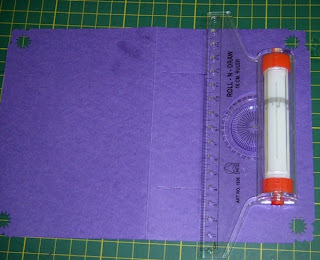 If you want to try it with white glue be prepared to be super-patient ! 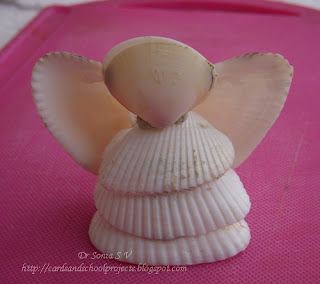 I used white Mseal to help to stick the shells together for the bigger angel which my daughter calls as " Mamma Angel". 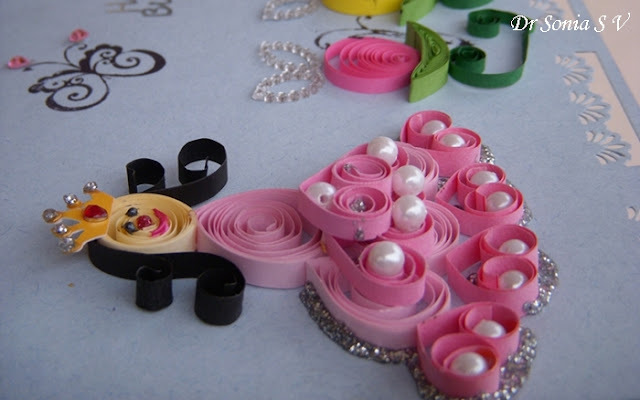 Stack 2, 3 or even 4 shells atop each other apply adhesive at points of contact and stick. Here is the view from the top to show how 2 shells are stuck together for the head and the wing attachment with Mseal. 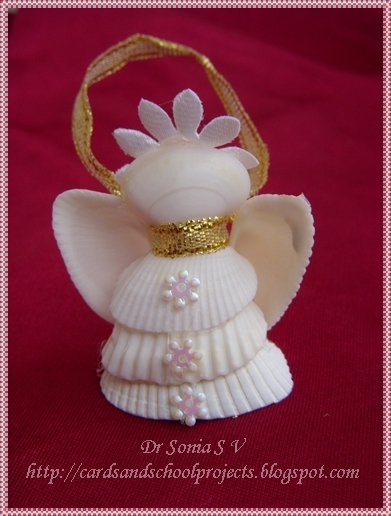 Here is our Shell angel all decked up. 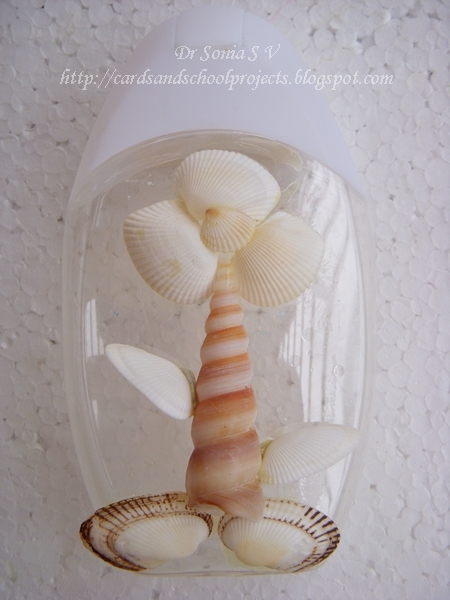 We added some fabric flowers to the wings.I tied a golden ribbon around the neck and also made it into a loop to make our shell angel a hanging ornament.All the embellishments were bought locally.You could add googly eyes or beads or even draw some facial features but somehow I didn't feel like adding eyes to the shell face as I wanted the natural shell beauty. 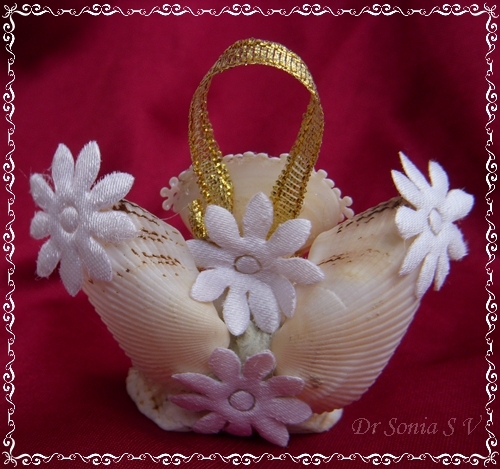 Here is the back side of the shell angel with the fabric flowers covering the adhesive and ribbon knot. 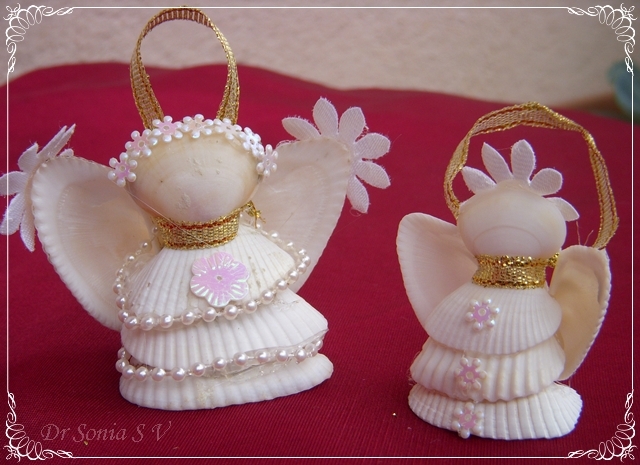 For the 2nd and smaller shell angel I used the glue gun [ available in India if anyone is wondering!] It gives a neater and lighter finish. 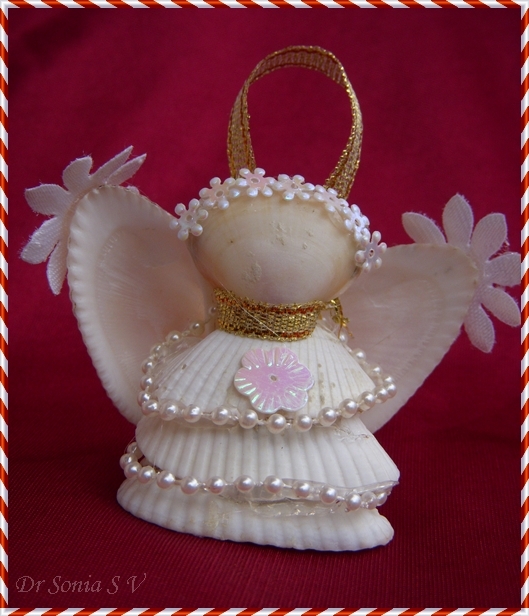 Add a loop of yarn or ribbon at the back of the shell angel and use it as Christmas tree ornaments or car mirror hanging. My little one wants to make a whole family of angles! We have Mamma and Baby Shell Angel now! Do try some shell craft and tell me how you like our shell angels and simple altered craft. I was quite busy the past week as I had to prepare my daughter for her "Just a Minute Competition" where she had to talk about a City in India from a tourism point of view. The talk had to be supported with a chart or model. I am from Kerala State in India and Kerala is popularly called " Gods own country" as it is so beautiful. 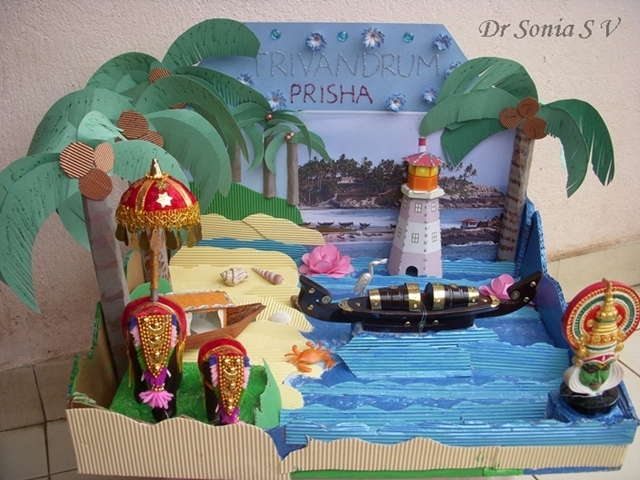 We chose the city Trivandrum ,the capital of Kerala and here is the diorama we made. 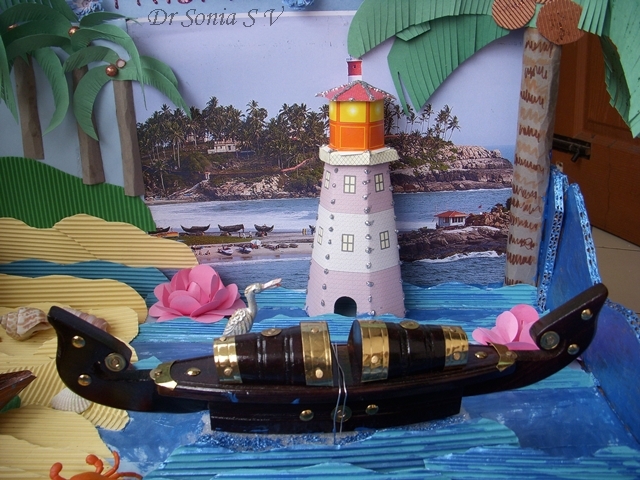 Kerala means the land of coconut trees and we have so many coconut trees and beaches abound! Here we made the coconut trees from chart paper and card stock.My little one stuck all the leaves and the coconuts.You can see her art work on the trunk of the coconut tree too! 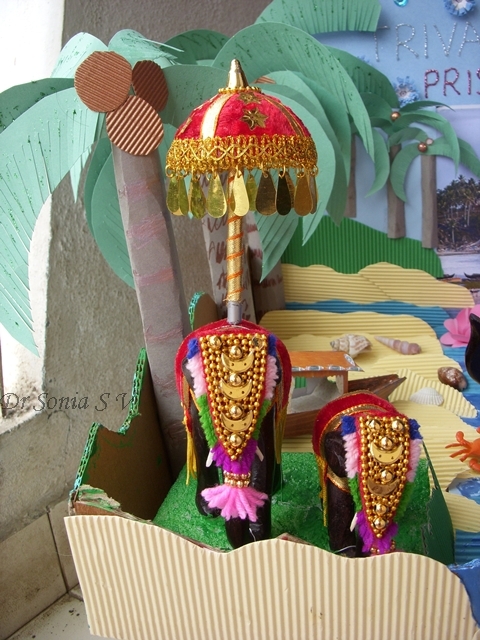 Here are the majestic Indian elephants all decked up for the temple festivals.These are wooden elephants available in most handicraft stores in India and are symbolic of Kerala where they are an essential part of temple festivities. 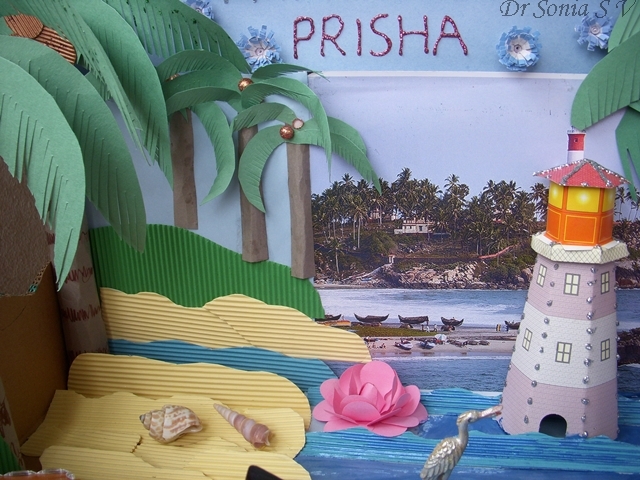 Let me play my part in Kerala tourism too!The background scene is the famous Kovalam beach in Trivandrum which is very popular with the tourists.My little one enjoyed making the paper lighthouse. 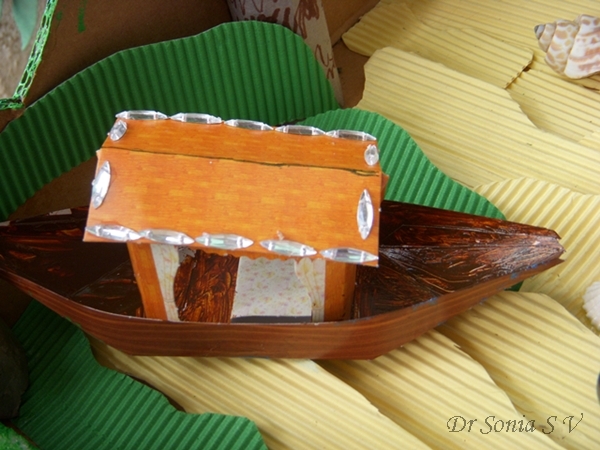 This is a paper boat we made and my 5 year old painted and embellished.If you get a chance to visit Kerala dont miss a chance to stay in a houseboat--its an unforgettable experience! 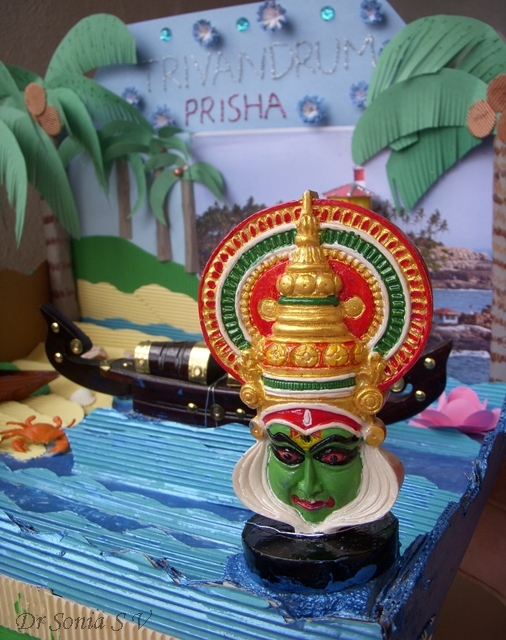 The photograph below shows a Kathakali dancer.Kathakali is a classical dance form from Kerala which often tells a mythological tale.The Kathakali dancers convey sentences and emotions so eloquently with their facial expressions and a visit to Kerala is incomplete without experiencing a Kathakali performance--it is spellbinding! 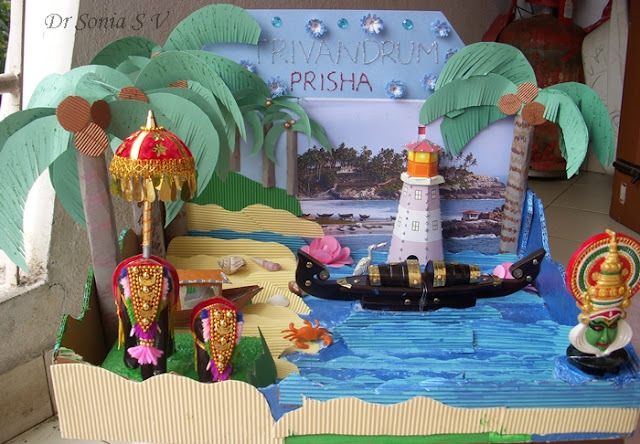 Sorry If I got a bit carried away with the tourism promotion-- all week I had been coaching my daughter about the tourism high points of Trivandrum ! Since I dont have a cutting machine we hand cut everything. 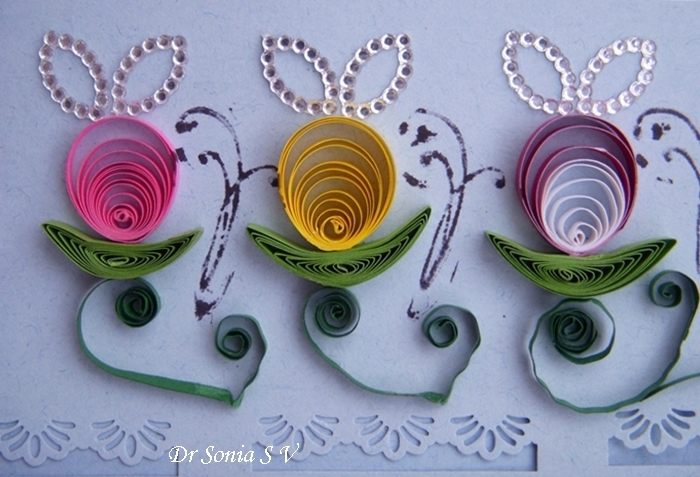 It was fun but time consuming.Corrugated paper adds a lot to the 3D effect and I used it to create the beach and the waves in the water.We also made a paper lotus from Punched flowers.Lotus flowers are abundant in the backwaters of Kerala. I find it much easier to do her school projects nowadays as she helps tremendously in the painting,sticking and cutting bits.Its becoming more enjoyable day by day-- so young mothers out there take heart- it only gets easier! 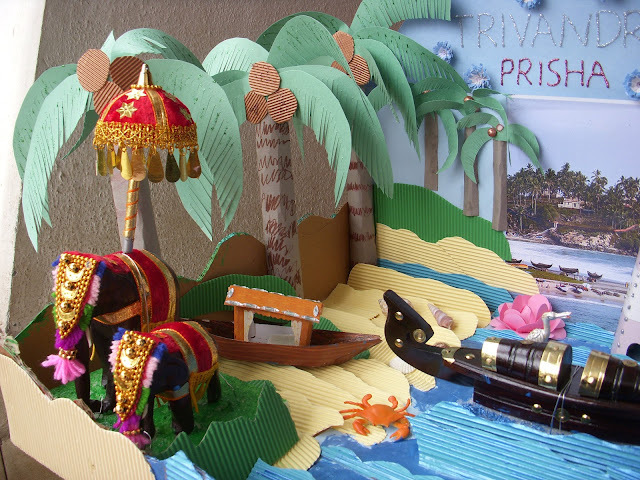 Our whole family chipped in to help my daughter make this project-Her Grandaunt gave ideas for the talk,her grandma got the elephants and the wooden boat when she went to Trivandrum,her Grandpa helped collect the photos for the flipchart I made for her to present and also the shells and the Kathakali and her Dad helped to tie up the elephants securely to the Diorama base.My daughter had her JAM competition yesterday and I am thrilled to share with you that she got selected! Hooray!